We’ll start with our honest and detailed VegasCasino.io review right away without any run of the mill introductions. Let’s get straight to the most important information about this bitcoin gambling platform. VegasCasino is a bitcoin sportsbook and casino operated by Vegas Royal S.A. and has been online for at least two years. They offer a variety of great bonuses and even award players free spins based on their recent deposits without any wagering requirements. On top of that, the most loyal VegasCasino players get extras in the form of cashback with low wagering requirements. According to the casino, players can create an account within 15 seconds. We registered an account, and the signup process really was lightning fast. New casino players don’t need to verify their email address but will get a welcome email from the casino to claim the first deposit bonus. The website is user-friendly with intuitive navigation and quick links to important sections; packed in a clean layout and modern design. The popular bitcoin casino advertises itself as one of the best bitcoin casinos featuring more than 300 games. All games in the casino are divided into eight categories – jackpot slots, video slots, roulette, blackjack, baccarat, table games, video poker, and live dealer games. Players can further categorize games using various filters such as new casino games, as well as featured, hot, and jackpot games. There’s also a search bar, so the players who know which game they want to play can easily find it. Another useful feature that can help VegasCasino players find their favorite games is the option of browsing through the games by selecting one of the casino’s games providers. Speaking of game providers, the below list covers them along with the number of games they provide for this casino. We weren’t sure why there were no games under the BetGames category. The website’s support explained that they were experiencing some technical issues, which is why none of the BetGames games could be seen. However, they claim to feature BetGames, and that we’ll be to play them once they were available again. Once we checked all available game providers and games they offer, there were 268 games in total at VegasCasino. However, the casino adds new games from time to time, so the players are constantly offered a greater selection. Bitcoin Baccarat, 7 Piggies, Mighty Arthur, Fairy Gate, and Rapunzel’s Tower are the casino’s latest game arrivals. Free play is also available at VegasCasino. Every game gives players the option of playing for real money, and there’s also the ‘practice’ mode which allows players to play all games without wagering real money. Even though there are no Bitcoin betting options or even classic Bitcoin dice games, VegasCasino does offer an excellent gambling experience. They are just focused on more traditional casino games. The VegasCasino website has the Technical Systems Testing logo, which means that all the games in the casino have been tested for fairness and are both fair and random. We also spoke to the VegasCasino support and asked about the provably fair games. The website’s live chat support representative told us that all Lion Games are provably fair. One of the first things we noticed right after we launched several games at VegasCasino is how quickly they loaded. The average loading speed for most VegasCasino games is about five seconds. However, since the website doesn’t use any browser caching tools, the games loading times constantly increase as you spend more time at the casino. When it comes to display ratio, all games have a 16:9 ratio, i.e., a widescreen display. We tested VegasCasino speed using Google Page Insights, and the website’s homepage got below average scores. However, with a few website optimizations such as leveraging browser caching, optimizing images, and minimizing redirects, the casino could have pretty decent loading times. We tested a few games at VegasCasino as well, and the average game PageSpeed scores were between 75 and 80 which is a rather good score for online casinos. While there is no app for Android and iOS devices, VegasCasino has a mobile version of the website that runs rather smoothly on different mobile devices. Mobile users can play VegasCasino games whenever they want, as long as they have an account on the website. The casino games load somewhat slower on a mobile device in comparison to the website’s desktop version. Aside from that, the overall mobile gaming experience is rather decent. VegasCasino currently supports only Bitcoin as a currency. However, the casino staff told us that they are working on implementing other cryptocurrencies as well in the future. The website offers links to popular online payment methods, namely Cubits and Bitpanda. Using one of these websites, casino players can purchase bitcoins which will then be sent to VegasCasino. Players who decide to buy bitcoins through Cubits can use Visa and MasterCard, Skrill, Sofort, Dotpay, and Union Pay. On the other hand, Bitpanda accepts the following payment methods: Sofort, Visa, MasterCard, GIROPAY, bank transfer, Euro Wallet, Skrill, Neteller, and redeemable vouchers. We contacted live support to tell us a little more about deposit and withdrawal limits. They informed us that both minimum deposit and withdrawal amounts are 1 mBTC. The representative also told us that casino players pay a deposit fee, while there is no fee for withdrawing funds as the sender pays bitcoin transfer fees. Finally, there is no maximum limit for deposits, and casino players can withdraw up to 50 BTC per week. We visited the VegasCasino.io promo page and found some really good bonuses. Bonuses and promotions are an essential part of our VegasCasino review so read on to find out more about them. VegasCasino welcomes its new players with a generous 100% bonus on their first deposit of at least 2 mBTC. The maximum deposit amount for this promotion is 1BTC, and before they actually make a deposit, players should enable the welcome bonus in their account settings. Casino players who want to get this VegasCasino bonus should wager their deposit 35x before they can withdraw their winnings. The second deposit bonus has the same deposit limits as the VegasCasino welcome bonus. After enabling this bonus and meeting the deposit amount requirements, players will be automatically credited with 50% of the deposit amount. The wagering requirement is 35x, and if players haven’t used the welcome bonus that comes with the deposit of 2 mBTC, they need to make a first deposit that is 1 mBTC or higher. With the Monthly Bonus, players can get 50% on the first deposit of the month. This bonus is available every month, and casino players are eligible for it even if they got the first and second deposit bonus. There is a wagering requirement of 35x, and the minimum deposit amount is 1 mBTC, while the upper limit for the bonus is 1 BTC. The casino gives players 25% of the amount they transfer to their account every single time. This promotion is valid for every deposit, as long the minimum and maximum deposit amount requirements are met, i.e., 1 mBTC and 1 BTC respectively. Before they can withdraw the reload bonus, players should bet the bonus amount 30x. Also, players can get no more than three 25% bonuses in 24 hours. The Promotions page lists all the previous bonuses and promotions, and from what we’ve seen, VegasCasino.io free spins are available quite frequently. To get your free spins, you should check your email for VegasCasino.io bonus codes. The casino usually sends their customers bonus codes as soon as new promotions are available. 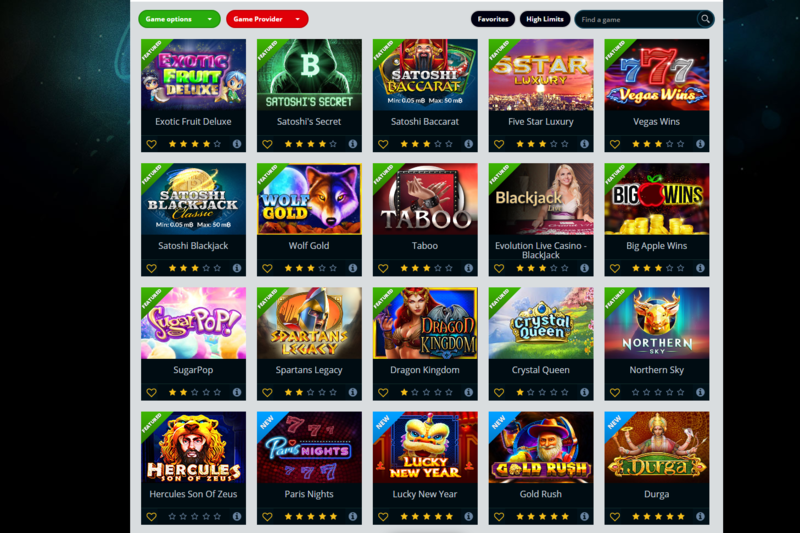 However, at the time of writing this review, there are no new bonus codes for free spins and the VegasCasino.io no deposit bonus is not available at this time either. Casino enthusiasts who’ve decided to join VegasCasino can become part of the casino’s VIP club just by playing games at the casino. By becoming VIP members, the casino players will have a unique opportunity to win up to 10 BTC or more by participating in the casino’s closed promotions which run each month. Other perks of becoming a VegasCasino VIP include unique deposit methods, bigger bonuses on transactions, and much more. As far as country restrictions go, VegasCasino has no limitations in this regard. While the website is only available in English, players from all countries are welcome to play at VegasCasino. When signing up for an account at VegasCasino, new players should provide their email address and date of birth. Most bitcoin casinos, provide a higher level of player anonymity, providing access to their players without asking for any personal information. There’s no information on the VegasCasino website about the casino’s licensing details. However, the live chat support told us that the casino holds a license in Costa Rica. To ensure a secure gaming environment VegasCasino works with Gaming Labs (TST) which guarantees fairness of each bitcoin game on the website. For players to feel safe and comfortable while enjoying their favorite games, VegasCasino uses SSL encryption technologies. Another way players can protect their personal data is to enable Google Authenticator for an extra level of security by activating a secure code for their account. Players’ account information can be further secured by fully verifying their account and completing the identity verification process. Casino players can contact the casino’s customer support via live chat and email, while phone support is not available for the time being. We reached out to them numerous times and spoke to several chat agents. All of them provided us with quick and helpful answers. The VegasCasino support never sleeps much like the city the casino has been named after. We’ll finish our VegasCasino.io review taking into account all the important aspects of VegasCasino such as game selection, security, and customer support. As there’s nothing not to love about it, we wholeheartedly recommend this casino without hesitation.